When Motor Trend tecnical director Frank Markus decided he needed to get away, you should know that his 'time out' wouldn't merely be a weekend at the local hot springs or camping down by the river. The MT crew has made fine work of taking glorious trips in glorious cars - and a Subaru Outback - and Markus would keep it up, tracing Viking routes and his own heritage in an Audi R8 V10 Spyder along Norway's Atlantic Road. We'd love to tell you about it but we'd be remiss - the story is worth the read and the video, after the jump, is even moreso worth the watch. To Markus and his steed, we say "skaal!" 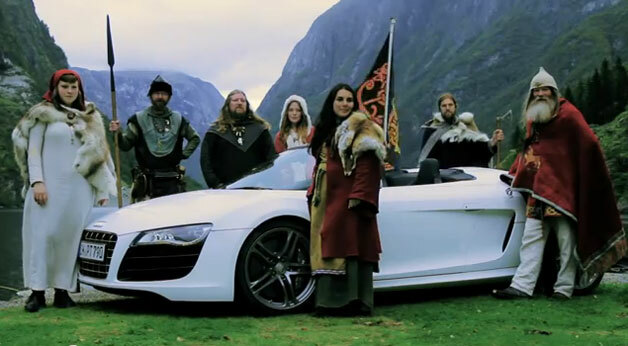 Motor Trend visits Norway, looks for lineage in Audi R8 Spyder originally appeared on Autoblog on Wed, 09 Nov 2011 19:59:00 EST. Please see our terms for use of feeds. If hopping on a motorcycle isn't thrilling or deadly enough for you anymore, you may want to point your browser toward eBay Motors. 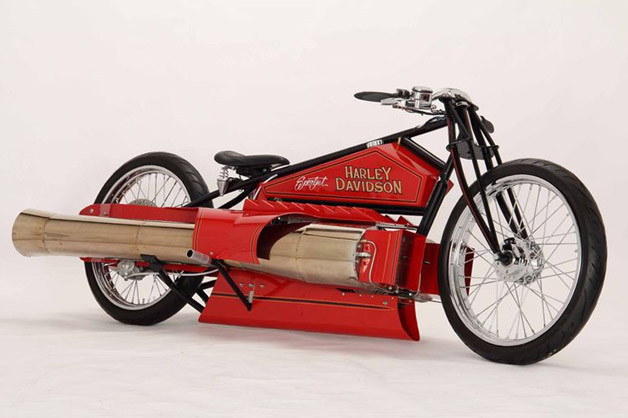 The world's first and only twin-pulse-jet-engine motorcycle is officially up for auction. The machine was originally constructed by Robert Maddox for a customer who wanted to try his hand at slipping into the 200-mph club. It's not clear whether the owner had a brief flash of sanity or if he simply found an easier way get his jollies, but the bike is now up for sale with a buy-it-now price of just $25,000. That's plenty cheap in our eyes. If we had money bleeding out of our ears, we'd snap up the wild machine, which is supposedly based on a 1929 Harley-Davidson flat-track racer (we imagine that might just mean modeled after...), and park it in our living room. The seller says the bike rides straight and, not surprisingly, is plenty quick. Head over to eBay Motors to check out the auction for yourself. eBay Find of the Day: Twin jet-engine board track Harley-Davidson originally appeared on Autoblog on Wed, 09 Nov 2011 19:29:00 EST. Please see our terms for use of feeds. 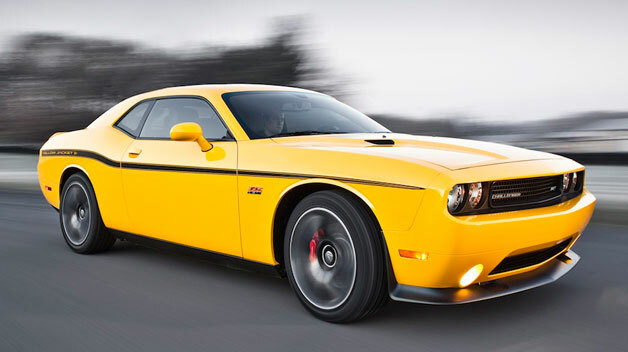 Chrysler has delayed plans for a dual-clutch gearbox in the United States, according to The Car Connection. 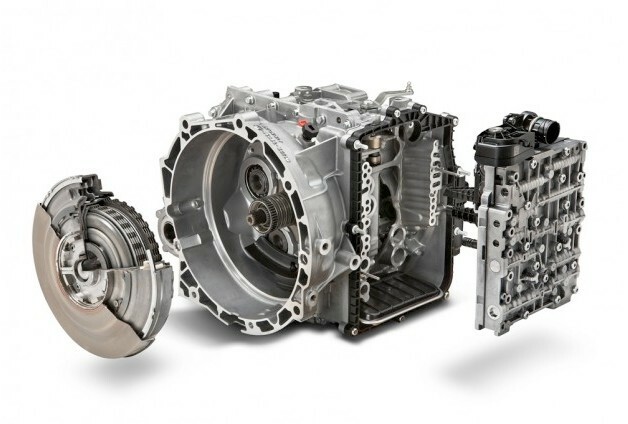 The high-tech gearbox was slated to be introduced with the 2012 Dodge Avenger and Chrysler 200, but refinement issues have reportedly put the introduction on hold. At present, the best transmission offered with the front-wheel-drive sedans is a conventional six-speed automatic. Fiat and Chrysler head Sergio Marchionne has said that any new product released by the reborn Detroit-based automaker has to be perfect before being offered to the public, and the automaker was concerned that Americans wouldn't like the feel of a dual-clutch gearbox. Europeans have had access to dual clutches in Chrysler products mated to diesel engines for several years. The Car Connection highlights the latest Ford Focus, as an example of a dual-clutch gearbox that feels unnatural to drivers who are used to a conventional automatic transmission, though the unit is functioning as designed. Consumer Reports has cited gearbox complaints from Focus and Fiesta owners as a reason why Ford's scores have dropped on its pages in the last year. After being further refined to suit American tastes, it's possible the new cog-swapper may be introduced in Chrysler's upcoming small car (possibly known as the Dodge Hornet) instead of first seeing duty in its range of mid-sizers. Chrysler nixes dual-clutch plans for 2011 over refinement concerns originally appeared on Autoblog on Wed, 09 Nov 2011 19:00:00 EST. Please see our terms for use of feeds. Lots of automakers participate in F1 racing: Ferrari, Mercedes-Benz, Lotus, Renault... and not so long ago, BMW, Honda and Toyota were in on the action, too. But while these companies have made their own cars, engines and even fielded their own teams in the top motorsport discipline, Infiniti's participation has been a little more removed. Nissan's luxury division, as you may well be aware, is one of the top sponsors of the current reigning championship team Red Bull. But without actually building or powering Sebastian Vettel's car, Infiniti has been on a constant search for ways to capitalize on its partnership. That could soon amount to a Red Bull-tweaked line of performance models, and has already lead to a Sebastian Vettel edition FX. But for those who can't stretch that far, Infiniti has announced - drum-roll, please - a vinyl wrap. The celebratory livery is available at an as-yet undisclosed price to current FX owners, but for the "lucky" ten customers who buy an FX now in the UK and win a tour of the factory, it could be theirs for free. We'd be glad to take the tour, but we'll leave the wrap off our luxury crossovers, thank you very much. 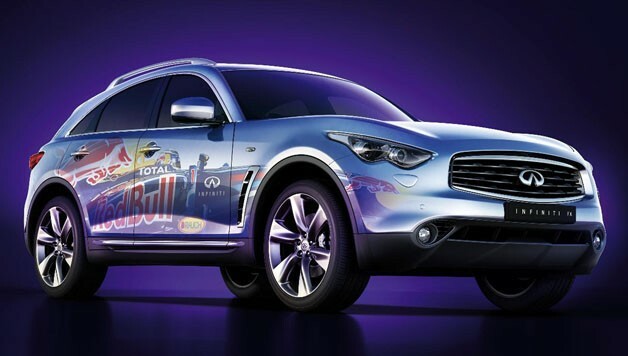 Infiniti and Red Bull wrap up the F1 season, FX in style originally appeared on Autoblog on Wed, 09 Nov 2011 18:39:00 EST. Please see our terms for use of feeds. Oh, how far things have come. NASCAR, as you may have heard, traces its roots back to moonshiners trying to outrun police cars. Now it'll be the stock cars chasing after the police when NASCAR rounds out the season at Homestead-Miami Speedway. The vehicles in question are Ford's latest "purpose-built" Police Interceptors - the Taurus-based sedan and Explorer-based utility - which Dearborn rolled out last year to replace the old-school Crown Victoria-based squad cars patrolling America's highways and city streets. The pair have been selected, much to the anticipated delight of race-loving cops, to serve as the pace cars for the upcoming Ford Championship Weekend, where all three of NASCAR's major series - Camping World trucks, Nationwide Series and Sprint Cup - wrap up their seasons. It's not the first time, of course, that Fords have been used as pace cars in NASCAR - far from it - but while the Focus, Explorer, Fusion Hybrid and Mustang GT have all taken their turn recently as what they'd call "safety cars" overseas, this is the first time in the many years of leading the field in law enforcement vehicles that Ford will use its cop cars for the task. 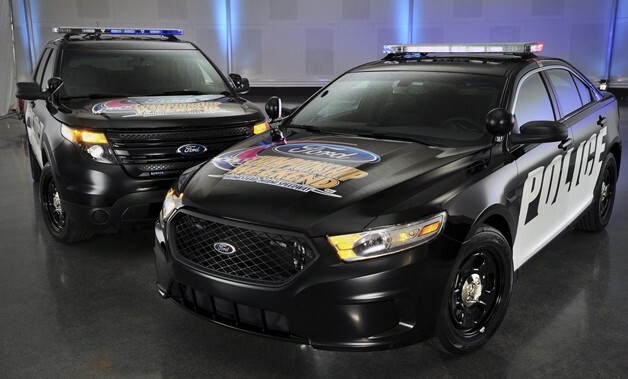 Ford Police Interceptor vehicles pacing NASCAR races in Miami originally appeared on Autoblog on Wed, 09 Nov 2011 18:20:00 EST. Please see our terms for use of feeds. It's official, folks. 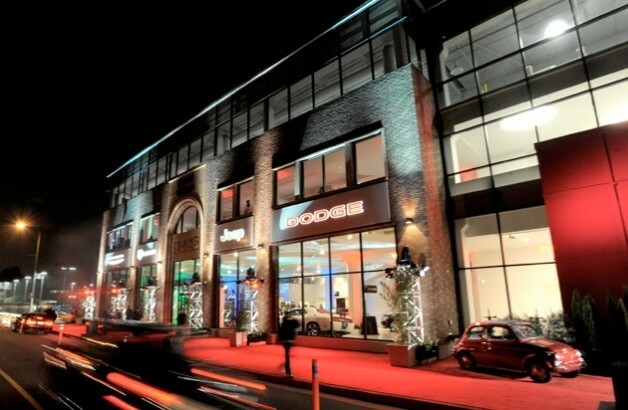 Motor Village LA, the posh dealership in downtown Los Angeles that Chrysler opened in California to serve as a showcase buying experience and test bed for innovative new Chrysler, Dodge, Ram, Jeep and Fiat stores, has been sold. New Century Automotive Group reportedly purchased the dealership from Chrysler in late October, 2011. Automotive News reports that two new dealer franchises licenses were awarded in the process, one for Motor Village LA and one for Fiat of LA. Apparently, despite the fact that the 189,000-square foot building and showcase glass tower is now in the hands of a separate entity, Chrysler still has to negotiate a settlement with the California Department of Motor Vehicles and the California New Car Dealers Association for opening a store within 10 miles of three other Chrysler dealerships, which is in violation of franchise laws. Chrysler sells controversial company-owned California dealership originally appeared on Autoblog on Wed, 09 Nov 2011 18:01:00 EST. Please see our terms for use of feeds. Buick will arrive at next week's LA Auto Show with this in tow: the LaCrosse GL concept. Were you hoping for a high-performance LaCrosse GS to keep the hot rod Regal GS company? Well, the LaCrosse GL isn't that, even though we thought Buick might be working on one based on these spy shots. Instead, the LaCrosse GL is billed as a design study to see just how luxurious one can make a LaCrosse. Turns out, very. For starters, the GL concept is coated in rich cabernet red paint that's set off by brushed and tinted chrome exterior accents. Even the 20-inch wheels, which are dead ringers for the wheel design used on the Regal GS, feature a muted satin finish. Inside, however, is where the LaCrosse GL concept makes a standard LaCrosse look downright pedestrian. The two-tone interior features contrasting dark cocoa brown and caramel chocochino leather on the seats and dash that's set off with ice-blue stitching to match Buick's signature ambient lighting hue. The entire headliner is also wrapped in suede, and the dash features an attractive wood grain inspired by the ombré patina on Les Paul guitars. Even the insides of the storage compartments are flocked like the inner lining of a jewelry box. Buick says that everything about the LaCrosse GL concept will inspire future Buick models, so we may be looking at a new top-tier trim level for the brand's large sedan. 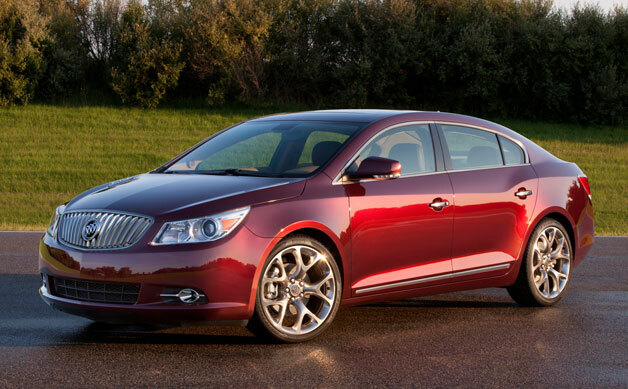 With the Lexus ES being this car's most direct competitor, Buick is smart to remind customers that it can do luxury just as well as the leaning L.
Buick LaCrosse GL concept goes for luxury with a capital L originally appeared on Autoblog on Wed, 09 Nov 2011 17:27:00 EST. Please see our terms for use of feeds. For their home turf show, Japanese automakers often bring out the best and quirkiest. To cite just a few examples, how about the three different Nissan Pivo concepts, the Honda EV-N and the Nissan Land Glider. Suzuki continues the trend this year with a full slate of world premieres of unusual designs wrapped around some eco-friendly powertrains. The theme seems to be that small is good, and the "big" star is the Regina (above), Suzuki's "vision of a next-generation global compact car" that gets 75 miles per gallon (U.S.) on the JC08 test cycle. The usual efficiency suspects - lightweighting and improved aerodynamics - help out here. The Regina weighs just 1,609 pounds (730 kg) and emits just 70 grams of CO2 per kilometer. Then we have the Q-concept, because apparently having one funky Japanese car defined by a single letter (the Mitsubishi i) isn't enough. The Q is the bright orange My First Discman thing you see above left, and it's a small city vehicle that's only 2.5 meters long and seats two in tandem style. 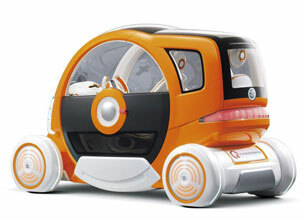 The interior arrangement can be adapted to fit more kids - or delivery goods - in the back. Suzuki doesn't specify, but we assume it's powered by electricity since there is no tailpipe and the automaker says the car (?) is "ideal for everyday journeys within a radius of about 10km." 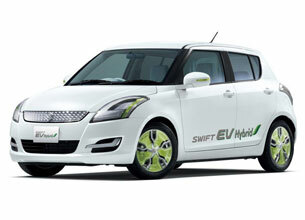 The most normal-looking vehicle that Suzuki will display at Tokyo Big Sight is the Swift EV Hybrid. A plug-in electric with an "engine-driven generator," the Swift EV Hybrid (also called the Swift Range Extender) can easily go between 20 and 30 kilometers (12 and 18 miles), at least, on battery power and then go further using liquid fuel. Exact details on the battery size and all-electric range will have to wait until the show starts in Japan at the end of the month. In 2009, Suzuki showed off the Swift Plug-In Hybrid. Suzuki will also display a new Swift Sport and a flotilla of two-wheelers, including some powered by fuel cells and batteries. Read more about them after the jump. 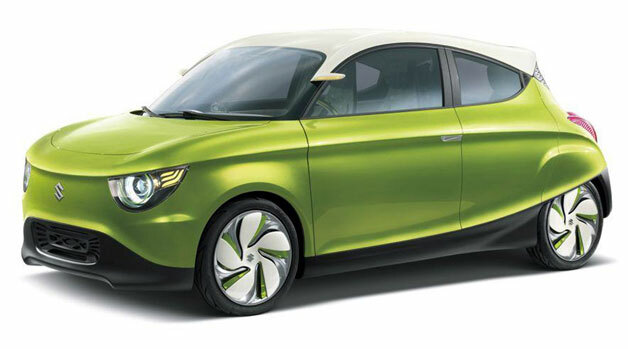 Suzuki gets small and funky for Tokyo with Regina compact, Q-Concept, Swift EV Hybrid originally appeared on Autoblog on Wed, 09 Nov 2011 16:57:00 EST. Please see our terms for use of feeds. What you're looking at is the production version of the 2013 Cadillac XTS, the full-size luxury yacht that will be doing double duty when it goes on sale next year to replace both the DTS and STS. 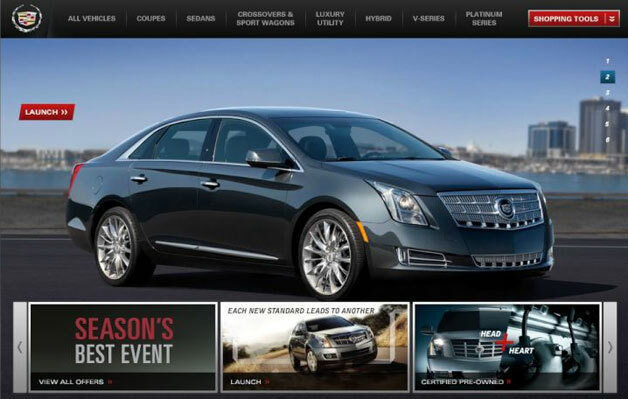 We were all set to see the XTS debut next week at the LA Auto Show, but Cadillac beat us to the punch when it accidentally slipped the above image into a slide show on the company's consumer-facing website. The image has since been removed, but as the Internet proves time and again, nothing is ever forgotten. The biggest thing going for the new XTS, besides its literal size, is the debut of Cadillac's new CUE infotainment system, which we gave you a hands on tour of earlier today. As for its looks, the production XTS appears to be almost identical to the XTS concept that debuted earlier this year at the 2011 Detroit Auto Show. The XTS concept is stunning to behold in person, though in pictures its design can appear too simple, lacking the visual impact that should be present in Cadillac's range-topping four-door. We'll have to wait until next week to see if the production XTS imparts the same first impression. Cadillac XTS makes early, unintended appearance originally appeared on Autoblog on Wed, 09 Nov 2011 16:34:00 EST. Please see our terms for use of feeds. 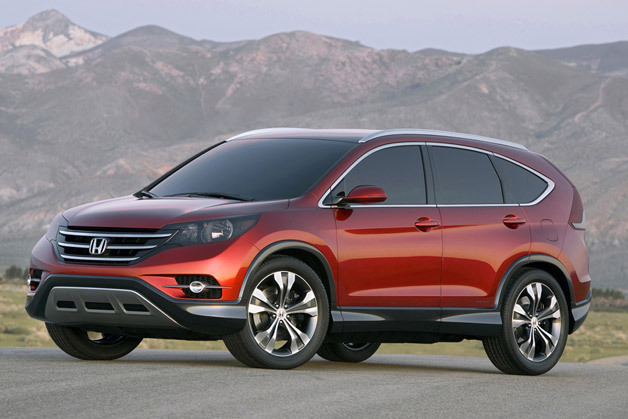 Automotive News reports that the 2012 Honda CR-V will, in fact, launch on schedule. Honda has reportedly told its dealers that the crossover will arrive on time despite initial concerns about the impact of Thai floods on the vehicle's production. Honda had originally cautioned that the vehicle may be delayed by several weeks due to a shortage of components produced in Thailand. That crisis has apparently been avoided. The 2012 Civic wasn't so fortunate. Weather delays related to the tsunami and flood disasters in Japan resulted in a production shortage for the new compact that hampered the model's launch. Even with the CR-V arriving on dealer lots as scheduled, Honda is still cutting back production to cope with component shortages. In a separate report, Automotive News says that the company is temporarily adjusting manufacturing at its six plants in the United States and Canada as a result of flooding in Thailand. Some of the facilities will operate at above the 50 percent capacity Honda originally forecasted when it became clear that the company's suppliers would be impacted by the weather. The slow-down is expected to stretch until November 25 in Canada and November 23 in the States. Despite Thai floods, Honda tells dealers 2012 CR-V will launch on time originally appeared on Autoblog on Wed, 09 Nov 2011 16:01:00 EST. Please see our terms for use of feeds. Way back when we were calling the SLS the SLC, the men and women at AMG in Affalterbach were keeping a secret: there would be an SLC in addition to the SLS. The current car that we have had the opportunity to love in coupe and roadster forms is slated to end production in 2015. What will pick up where it leaves off is the SLC, a so-called "baby SLS" with a 4.0-liter V8 and an eight-speed, dual-clutch transmission. Car magazine predicts the future coupe will have aluminum-intensive construction and be a better performer than the SLS it replaces. It could also be a median point, itself a 911 rival but perhaps serving as the basis for both an SLK variant and some other carbon fiber supercar beyond the SLS that could challenge a McLaren. After the unloved offspring that was the Mercedes McLaren SLR, we'd be in the front row of any grudge match to see if a hotted-up SLC could settle that sore score. 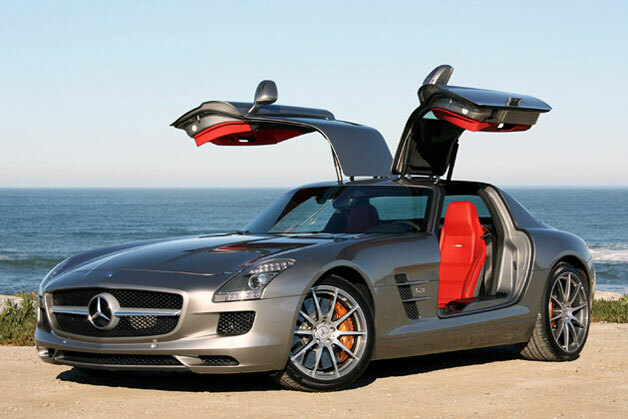 Mercedes greenlights 911 fighter, reviving SLC name originally appeared on Autoblog on Wed, 09 Nov 2011 15:32:00 EST. Please see our terms for use of feeds. We just wrapped up our first hands-on with Cadillac CUE, the luxury automaker's attempt at a modern, fully-integrated infotainment system for the upcoming XTS, ATS and refreshed SRX. First impressions are favorable, although in its current form the system is still very beta in both execution and response. However, the core tenants of the system - a capacitive screen with multitouch control and proximity sensors, capacitive center stack buttons and a configurable instrument panel - are all functional and incredibly slick, despite some slow responses and awkward transitions. 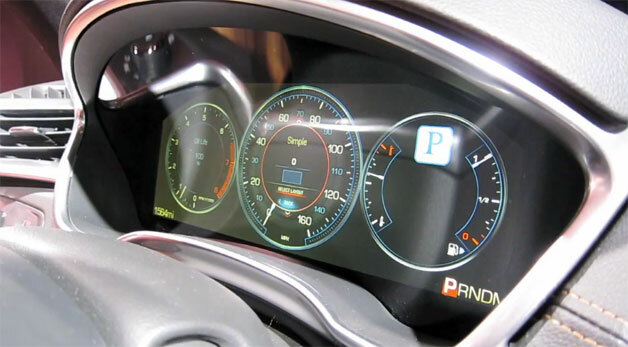 Cadillac's electronics and HMI team have been working on CUE for the better part of four years and their efforts show. And with daily builds of the system being developed and deployed, they're well on their way to having the system ready for prime time when the XTS arrives early next year. Get a taste of CUE in action in the video after the jump and look for an animated cameo of the XTS towards the end. Hands on with Cadillac CUE originally appeared on Autoblog on Wed, 09 Nov 2011 14:57:00 EST. Please see our terms for use of feeds. Aston Martins often prove capable of tangling with the likes of Ferraris and Lamborghinis. But one thing that sets them apart is that, while their Italian counterparts often place their engines amidship, Astons are always front-engined. Right? Well, discounting their Lola-built LMP1 Le Mans racer, everything that rolls out of the factory in Gaydon - much as they did before at Newport Pagnell - has its engine up front, even with supercars as exotic as the One-77, V12 Zagato and Vanquish. That's where HBH comes in. The Danish firm, as we initially reported back in May and followed up on in July, takes its initials from the last names of its brain trust: Jesper Hermann, Christian Brandt and Torben Hartvig, who between them have a wealth of niche supercar experience to impart. 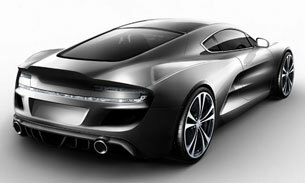 For their latest project, the trio teamed up to produce the vehicle you see here: the Aston Martin Bulldog GT. Aside from the engine being place behind the cabin, the Bulldog GT features unique aluminum bodywork that looks suitably Aston-like and accommodates placing the engine in the middle. And in case the 6.0-liter V12 lifted from the Vantage weren't powerful enough, HBH has bolted on two superchargers to boost output up to 666 horsepower. That's said to be enough for a 3.9-second run to 62 mph and a 186-mph top end, but we wouldn't be surprised to find those numbers conservative. Perhaps the most intriguing bit is that HBH is not just selling the car, but half of its production rights along with it. That means the buyer can choose whether to keep it as a one-off or put it into limited production and reap the rewards. Sounds like an interesting business model to us. Take a closer look at the finished product in our gallery of images and draw your own conclusions. 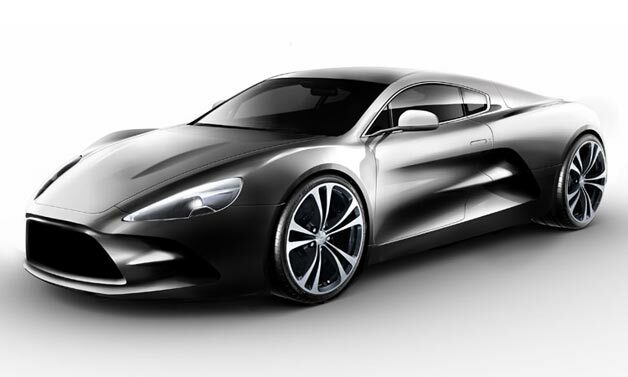 HBH reveals final design for mid-engined Aston Martin Bulldog GT originally appeared on Autoblog on Wed, 09 Nov 2011 14:31:00 EST. Please see our terms for use of feeds. 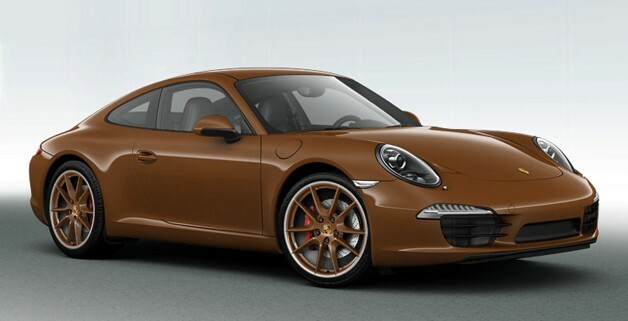 2012 Porsche 911 configurator is here to haunt your dreams originally appeared on Autoblog on Wed, 09 Nov 2011 13:56:00 EST. Please see our terms for use of feeds. Yesterday, Lincoln released the teaser you see above on its Facebook page, showing what's in store for the automaker's revised design language that's coming soon (we're guessing it's the hood and fender of the redesign MKT). Lincoln states that its new styling direction will be "forward-looking and more elegantly crafted," and it appears that we'll get our first glimpse at the fruits of the company's labor at the LA Auto Show next week. Autoblog reader Tony tipped us to this page on the LA Auto Show website, which lists all of the vehicles that will debut at the Los Angeles Convention Center next week, and both the Lincoln MKS and MKT are listed under the "world debuts" section. Makes sense, since we've already seen the refreshed versions of the Ford Taurus and Flex on which the Lincoln vehicles are based, respectively. When asked, a Lincoln spokesperson was unable to confirm that we would see the new sedan and crossover in LA. Unlike the current vehicles, the 2013 MKS and MKT are expected to differ greatly from their respective Ford kin. While not officially confirmed, sources within the automaker have suggested that the updated vehicles will use new running gear in order to fully differentiate them from their Ford counterparts. Of course, Ford's EcoBoost engine technology will be on hand, though other enhancements like suspension and steering upgrades will also likely be in the cards. Stay tuned for the full details from the LA Auto Show next week. 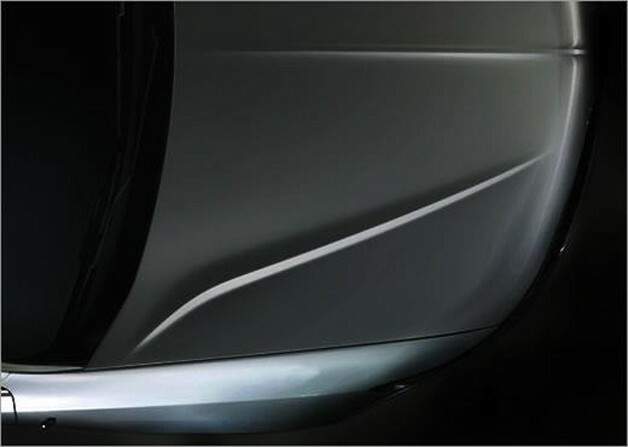 Lincoln teases new design language; 2013 MKS, MKT headed for LA Auto Show originally appeared on Autoblog on Wed, 09 Nov 2011 13:28:00 EST. Please see our terms for use of feeds. Chrysler is taking a page from the insect world with its latest set of high-performance machinery. Just as the bright yellow and black motif of a bumble bee is meant to warn potential predators that they might get stung if they come too close, the new 2012 Charger SRT8 Super Bee and Challenger SRT8 392 Yellow Jacket feature Stinger Yellow and Pitch Black paint schemes to signal their ill intent. Included in the Charger Super Bee package for 2012, in either yellow or black motifs, is a full sticker and stripe package highlighting the 3D helmeted bee logo along with five-spoke aluminum wheels with black painted pockets. Inside, the cloth interior is punctuated with yellow and silver striping and stitching. Subtle it is not. Similarly, the Challenger Yellow Jacket is covered in various coatings of yellow and black, both inside and out, with the addition of a new Yellow Jacket logo. Both models come equipped with Chrysler's venerable 6.4-liter Hemi V8 engine that puts out 470 horsepower and 470 pound-feet of torque. 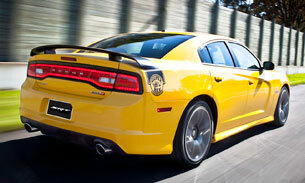 The Challenger is available with either a six-speed manual or five-speed automatic; the Charger offers only the auto. You'll be able to see both machines live and in living color at the upcoming LA Auto Show. Ordering is slated to begin in December and the first shipments will arrive sometime in the first quarter of 2012. Pricing has yet to be announced, but you can read all about each machine in the press releases after the jump. Dodge Challenger SRT Yellow Jacket and Charger SRT8 Super Bee debuting in LA originally appeared on Autoblog on Wed, 09 Nov 2011 12:58:00 EST. Please see our terms for use of feeds.